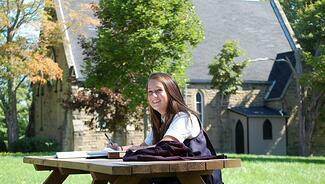 We would love to welcome you to King’s-Edgehill School and show you around! We encourage you to schedule a full day so your child can get a true feel for our family and our campus, and you get all your questions answered. Your child will be a student for a day, he or she will be teamed with a student in the same grade to tour our residences, facilities, and chapel, and join in for meals and classes. You will tour the facilities with a member of our admissions team and have an opportunity to sit down and have all of your questions answered. This is also the ideal time to learn about our financial aid and how families pay for a King’s-Edgehill education. You will also meet members of our King’s-Edgehill School family: Mr. Seagram, Headmaster; members of our faculty; athletic coaches; arts instructors; the house parents who care for our boarding students; maybe even a campus puppy or two! Fill in this form and we will contact you to plan your visit.